US, 1941, 81 minutes, Black and white. Warner Baxter, Ingrid Bergman, Richard Denning, Fay Wray, Susan Hayward. 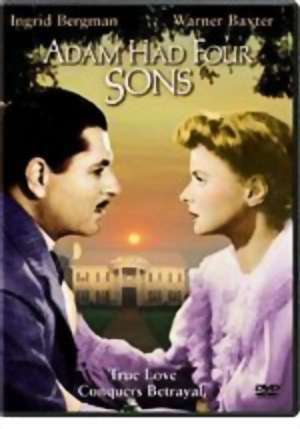 Adam Had Four Sons is pleasing American family saga, set at the turn of the century and into the period of World War One. It starred Warner Baxter, a reputable actor from the '30s, with newcomer Ingrid Bergman, who had appeared in Intermezzo and was about to appear in Dr Jekyll and Mr Hyde, Rage in Heaven - and then Casablanca. Susan Hayward, at the beginning of her career, has a very strong role. The supporting cast includes Fay Wray and Richard Denning. The material is familiar - and now the subject of mini-series. Direction is by actor-director Gregory Ratoff who directed Bergman in Intermezzo. 1. An entertaining 1940s family saga? 2. Black and white photography, the period, the romantic score? 3. Ingrid Bergman and her impact an the American and world-wide public? Susan Hayward at the beginning of her career? 4. Family saga, a piece of Americana, the transition from the 19th century to the 20th, to the period of World War One, to the modern era? A romantic small town idyll to the break-up of family, betrayal, death? 5. The opening with the photo of the Stoddards, the financial world, Adam and his background in the American 19th century, the business world. the family, wife and love for her. the four sons, playing, fighting? The governess and her affecting the family's life? 6. Adam as the American 19th. century hero, background in football, good at business - yet failure? A good husband. father? The death of his wife and its effect on him? The sons, to boarding school, the selling of the house, Emilie having to go back to France? His attachment towards Emilie? Bankruptcy, coming up again in the world? The passing of the years? Emily’s return? The outbreak of war, the involvement of the boys? Hester and her place in the house? Adam's liking for Hester? The clashes, the puzzle about Emilie and Jack's behaviour? The crisis. David and his crashing the plane? The emergence of the truth? The happy ending? 7. Adam's wife, nice, her sons, the farewell scene, her death? The humour with Cousin Philippa and her gin-drinking? her death - and Emilie's covering the situation? 8. Ingrid Bergman as Emillie, her beauty, youth? Arrival, immediately charming Adam and the boys, playing with them? The wife's death? Having to leave - the night of her leaving and her sadness? The joy of her return? Love for Adam? Her suspicions of Hester, her being aware of the truth? The clashes with Hester? Tension, going into the room -with Jack to mislead Adam, not wanting to hurt him? Concern for David? The truth with Jack? The final clash with Hester? The happy ending? 9. The boys: Jack, the elder, as a youngster, with the others? His growing up, welcoming Emilie? David and the news of his being married? David away, Hester's behaviour, the attachment towards Jack? Misleading Adam? David's return? Hester's drinking, David's going out and crashing the plane? Hester's reaction? The truth? Chris and Phil, friendships? The impact of the war? 10. Hester, her youth, tramp, her wiles, with each of the family, the clashes with Emilie and her taunting her with the love for Adam, Jack and the affair, drinking, the truth, her being ousted from the house? 11. Vance as the girl across the street, attachment towards Phil, concern about him? His injury and return from the war? 12. An old era and its re-creation: business, houses, cars? The beginning of the 20th century, changes, the war? People growing up, love, disillusionment, marriage break-up? get hope? The American style?